Walk over to the Wood Village Baptist Church for the community celebration of Wood Village's Nite Out. Join your neighbors in free food, drinks, entertainment and more on Friday, July 17th 2015. Wood Village Nite Out will be from 5 p.m. until 9 p.m. and you'll want to get there early for a good view of the parade. 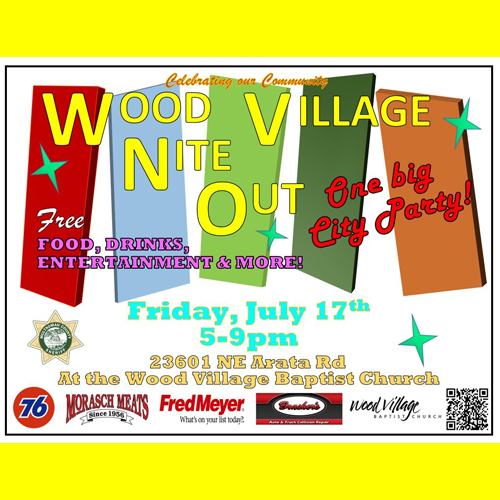 Learn more about the Wood Village Nite Out below. Bring the whole family to the 16th Annual City Nite Out is on Friday July 17th from 5-9pm at the Wood Village Baptist Church located at 23601 NE Arata Rd. The event will start with an emergency vehicle parade through the City (Click Here to View the Parade Route) at 5pm, and the event itself will start at 5:30pm. There will also be a RedCross Blood Drive from 3-8pm. Please click Here to sign up to donate blood at the event.